I'm Here. I'm Queer. What the Hell do I read? : Exciting Personal/Professional News! This has been in the works for a while, and I have to say I'm thrilled to announce it! I really like the quality and heart so evident in every one of Little Pickle Press' books and Apps and other media, and love the foundation that supports everything they're doing - they're out to create content that gets young people and their adults talking about things that matter, towards making this a better world. That's very much my foundation as well, for my own writing, and this blog - to create content that makes this a better world! Here on this blog, not much. I'll also continue to blog for SCBWI and lead their Team Blog at SCBWI's two major international conferences each year in New York and Los Angeles. And I'll still be writing, evenings and weekends, towards sharing my stories with the world, too. So happy to share my good news! Yayayayy!! Congrats Lee. So happy for you and your family. Much love. Congratulations!!!! They are lucky to have you. Isn't it cool when everything comes together & you realize why you've been gathering all of those random skills? Congratulations! Tres cool. May the new gig & the new co-workers keep you smiling. Congratulations Lee! Not many people can say they've watched your journey since the day you were born, but as your older brother I can :-) And this job is such a natural and exciting evolution of your life's journey and work!! So proud of you. What wonderful news Lee. I wish you all the best in your new endeavor! Congratulations, Lee! What a great choice! I just saw this. Seems a perfect gig for you. I'm so happy for you, Mr. Vice President. WONDERFUL, Lee! 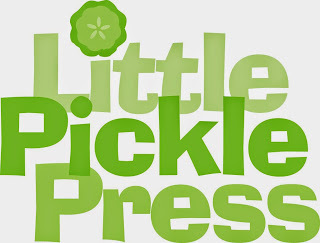 I didn't know much about Little Pickle but now that I've been on their website, I can see how this aligns with your life and your spirit. Mazel tov, Mr. Vice President!